Cross Up 8409: two products in one. 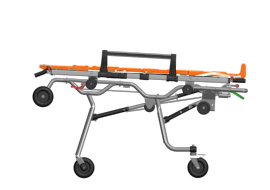 A self loading stretcher with adjustable heights created for working in extreme operative conditions. 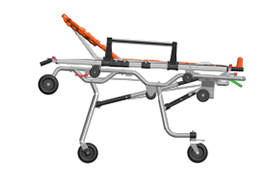 A detachable stretcher that allows the operator to assist the patients wherever they may be in a fast and secure way. Incredible manoeuvrability, modularity and an exceptional geometrical design to optimize the work of the operator. 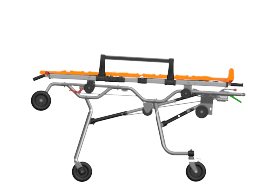 The stretcher can be loaded by one single person without having to lift the weight of the patient. With one simple gesture the detachable stretcher comes away from the trolley and insertion is made easier thanks to an automatic mechanism. 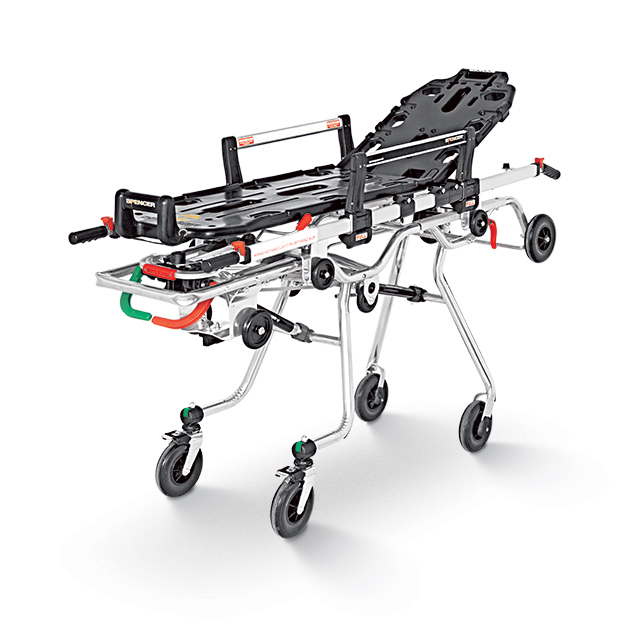 The telescopic handles guarantee a comfortable and secure grip of the detachable stretcher making it easier to lift the patient. Despite Cross Up 8409's simple style the stretcher has not renounced the ergonomics of the commands. Cross Up 8409 is moreover completed by the optimization of the space, the stability of the support area, the safety of the kinetic mechanisms and the reliability of the materials chosen. 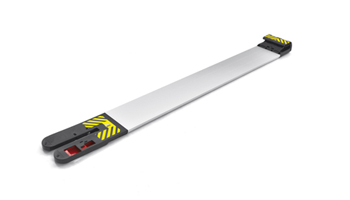 Characteristics that all together make this stretcher pass the most difficult tests with excellent results. It is not a simple stretcher but an authentic emergency system. 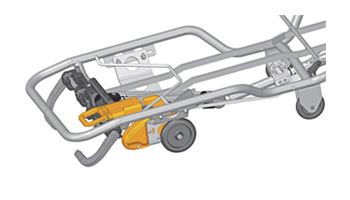 Spencer stretchers are also distinguished by their MBC backrest mechanical regulation system, a real milestone in the technique of blocking systems. A system that guarantees trustworthiness and durability for millions of manoeuvres without having to use any kind of lever and above all allows raising of the backrest even laterally. To reset the level or select intermediate positions you use just one hand to activate the ergonomic handle, placed in a distal position, easily found and at the same time, sustaining the weight. A clever and unprecedented mechanical system, that interacts with a rack made from the top of the patient surface mould. 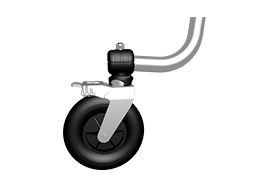 It assures the use of the anti-shock system in one swift movement, without the need to use compound levers. To reset the level or select intermediate positions you must modify the position of an easily identified lateral lever. The two configurations, anti-shock and comfort are operated simply by intervention on any area of the patient surface. For safety reasons, resetting is carried out using two lateral levers. Spencer has developed a new concept of suspension; the SCS system (Spencer Compliance Suspension), that represents an important step forward in the field of passive suspension construction. SCS differentiates itself from the traditional approach by the way in which it generates movement of the suspension under load. In fact, it uses a simple arm with particular properties of rigidity which allow the arm itself to guarantee its traditional structural role and also to make an important contribution to the movement of the suspension when under load. No matter what the kind of surface, the special curved shaping of the legs modify immediately the softening effect of each wheel. The result of this integration of functions is a system that can guarantee a high level of comfort and safety without the complexities and high costs normally associated with an equivalent performance. Among the improved characteristics, the most significant is the lengthwise flexibility of the suspension, which is fundamental in the creation of high levels of comfort.